Welcome to the Shop Website! My name is Warren and I'm the Owner. Below is just some of the different things I do, I take Pride in my work so you can take pride in what you paid for. Install Convertible Tops and Back Windows, Vinyl Tops, Recover Headliners (the ceiling in your car), Recover and Repair Seats (Cushions,Frames,Covers), Door Panels, and install new Carpet. 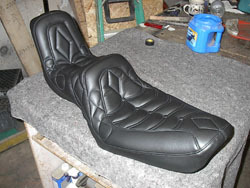 I also Recover Boat Seats, Motorcycle Seats, And do a lot of other misc repairs. If you would like to know if I can help you Please feel free to ask. The only dumb question is "the one you didn't ask". My shop is located at 205 S. Locust St. in Hagerstown Maryland My hours are Monday - Friday now 9:00-5:00, If you have work you would like to have done or would like an estimate, feel free to stop in. If those hours are not doable for you, call me and I will make a time that better fits your schedule. 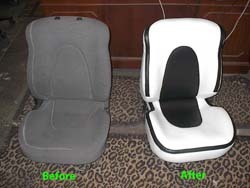 I have a few pictures of some of the Cars, Trucks, Boats and Bikes I have Upholstered. There are many more but this is what I was able to photograph. So check them out and Enjoy! If you noticed my competitors don't show there work, I wonder why.